Authorities in Texas are asking for the public's help in tracking down "affluenza teen" Ethan Couch, who disappeared — possibly with his mother — while on probation for killing four people during a 2013 drunken driving wreck. Ethan Couch, 18, vanished after failing to show up for a scheduled meeting with a probation officer last week. His mother, Tonya, is also missing, and authorities suspect they may be together. A $5,000 reward has been offered for information leading to Couch's capture. "We have literally, over the past few days, run down hundreds and hundreds of leads," said Tarrant County Sheriff Dee Anderson, during a press conference Monday morning. "Those leads continue to pour in." Authorities have issued the juvenile equivalent of an arrest warrant for Ethan Couch, whose case is still in juvenile court. The Tarrant County district attorney said during a news conference Monday her office filed a motion in November to transfer his case to adult court. During the weekend, authorities turned up the heat on 48-year-old Tonya Couch, who is now listed as a missing person by the Tarrant County district attorney. The move will allow police across the country to see her in a national database, NBC News reported. "We believe that she's helping him," Anderson said Monday. U.S. 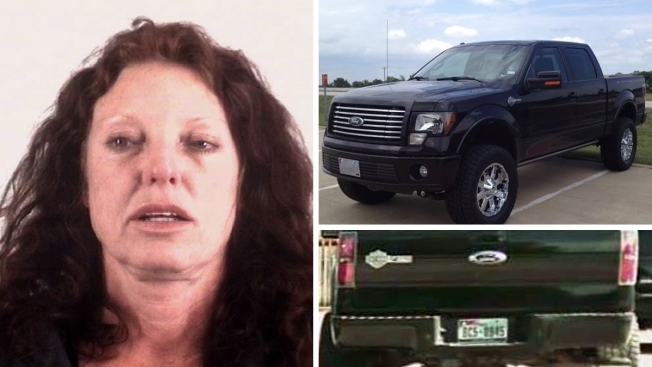 Marshals asked the public to be on the lookout for a black 2011 Ford F-150 Harley-Davidson edition truck belonging to Tonya Couch. The truck has 23-inch chrome wheels, the Texas license plate BC50945 and damage to the passenger side rear panel. "We’re trying to account for everything that might be possible," Anderson explained. Ethan Couch could face up to 10 years in prison after his capture. The U.S. Marshals told NBC News on Sunday that Couch is not beyond their reach, even if he fled the country. His mother could also face charges if authorities determine she helped him disappear. "It really doesn't matter if he flees the country," Richard Taylor, acting U.S. Marshal for the northern district of Texas, told NBC News. "We're going to find him and we'll make every effort to get that person back." Officials have said they don't know Couch's whereabouts and have expressed concern that he may have left the country, although Sam Jordan, spokeswoman for the Tarrant County district attorney's office, said there's no specific indication he has crossed the border. Couch was supposed to be accompanied by a parent for a regular visit Dec. 10 with his probation officer. Authorities issued an order for his arrest the next day, after he failed to show. A $5,000 reward has been offered for information leading to the capture of Couch. Tarrant County investigators were looking for Couch to ask him about a video posted online a few weeks ago showing people who appear to be playing drinking games at a party. One appears to be Couch, who could face revoked parole and a 10-year prison sentence if found drinking. Anderson said he suspects Couch fled in the days after the video came to light. "I believe he felt like the other shoe was going to drop," Anderson said Monday. He said Couch and his mother may have left the area in late November, shortly after Couch attended a mandatory meeting with his probation officer and well before their next scheduled meeting on Dec. 10. Anderson and Tarrant County District Attorney Sharen Wilson called on Couch to turn himself in Monday, saying, "the longer he's gone, the worse it's going to be" because authorities won't give up the search. WHY WASN'T COUCH ALREADY IN PRISON? In June 2013 at age 16, Couch was driving drunk and speeding on a dark, two-lane road south of Fort Worth when he crashed into a disabled SUV, killing four people. Among the injured were some of the seven teens in Couch's pickup. Couch pleaded guilty to four counts of intoxication manslaughter and two counts of intoxication assault causing serious bodily injury. Because of his age, he wasn't certified as an adult for trial and a judge sentenced him in juvenile court to 10 years' probation and a stint in a rehabilitation center. Authorities on Monday called the sentence "a miscarriage of justice" and said they hope Couch "will finally be held accountable" when he is caught. According to Anderson, Couch showed no remorse after the crash. "We saw absolutely no guilt or bad feelings or sympathy toward the four families and the four lives that he'd taken," Anderson said during Monday's news conference. DOES COUCH'S MOTHER FACE CHARGES? Terry Grisham, a spokesman for the Tarrant County Sheriff's Department, said investigators haven't confirmed whether Tonya Couch fled with her son and declined to say whether she's facing any charges. Anderson, the Tarrant County sheriff, said Couch's father, Fred, told investigators he hadn't heard from his son or ex-wife in about two weeks. Wilson said during Monday's news conference Fred Couch was "apparently cooperative" with investigators. Anderson called him "polite" but said he offered no useful information.